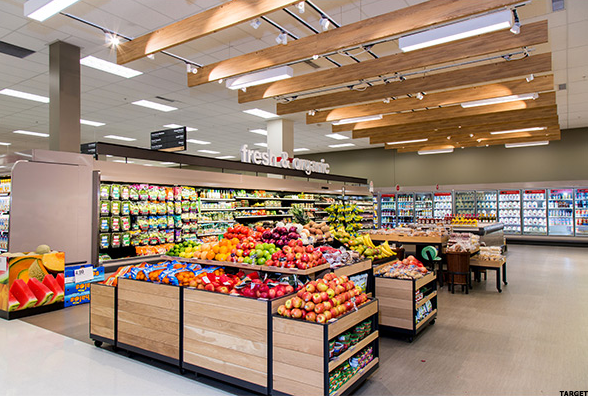 Target is piloting new concepts in 25 stores in Los Angeles, spotlighting improvements including new lighting and displays, specialists to aid customers in departments like beauty, and dedicated stations supporting click-and-collect services, according to The Street. Target's "LA25" concepts, which bring together under one roof store enhancements the retailer is testing in select locations across the U.S., also emphasize upgraded in-store dining options, replacing the chain's traditional popcorn and hot dog concessions with sleeker Starbucks cafes, Freshii salads and Which Wich deli sandwiches. Target will spend $1 billion this year to overhaul the shopper experience: It will fully remodel 39 locations in 2016, and and open 15 new stores, The Street notes. Target selected Los Angeles for the pilot in part because California represents its biggest market, with 260 stores across the state, and because the area is home to a mix of big-box and smaller format stores. This is an excerpt from an article posted on RetailDive.com. For complete article, click here.